As virtualization takes a hold in many IT organizations it often adds another level of complexity and a blind spot within your traditional monitoring infrastructure. Using SteelCentral Aternity, you can see how your VDI environment is performing from the point of view of your user (workforce) community. I recently had a customer that was trying to compare two different VDI environments, each with different CPU speeds. Before SteelCentral Aternity, they were using stopwatches and an Excel spreadsheet to compare performance, which was not accurate and or easy to do for rapid transactions. We deployed the SteelCentral Aternity Agent on each environment and told the users to perform the tasks within the application as they normally would. Within a few minutes we were able to see the transactions that the users ran with their exact response time, all displayed within the SteelCentral Aternity console. No need for spreadsheets or stopwatch! In the Analyze Dashboard above, the VDI environment with 2.5 to 3GHz CPUs has visibly better performance than the VDI environment with 2 to 2.5GHz CPUs. With this information, the customer knew which of the environments would garner the better performance. In the next example, I had a customer that wanted to know what the impact would be if they replaced their desktop machines with VDI for their major applications. In order to start showing relevant metrics, we took a commonly used application, Outlook, and began our investigation with the customer. In the Device Comparison Dashboard, it’s’s clear to see that a VDI environment shows significant improvement over a desktop environment. With SteelCentral Aternity, we were able to show the customer that the response time for the activities in the VDI environment is improved, as in the screen shot above, the blue vertical line shows the VDI performance in relation to the Desktop performance (which is indicated by the horizontal bar). The Trends pane will show the Activity Status over time, which can display any timeframes where performance has degraded. In the Status pane, we can see that there are not as many major and minor deviations, which results in a better overall end user and workforce experience. The Business Locations on the bottom left-hand side of the above screen shot shows the performance change by location. Therefore, it is clear to see that OKC users will improve their performance from 74% to 94% if they migrate to VDI. However, the case for VDI is not always so clear. I have seen on several occasions that the response times on VDI were substantially worse. There are a few factors to consider, and SteelCentral Aternity can help! . As we saw above, the specs of the VDI environment can make a difference. Slower CPUs or not enough cores or memory can greatly impact a user’s experience. Network speeds and bandwidth can also be a hindrance. One customer I worked with had a very powerful VDI environment but as we were reviewing the Business Locations pane, we noticed that one of their external locations had significantly worse performance for one of their key applications, which they were planning to migrate to VDI. After some investigation, we discovered network congestion at the site that slowed the VDI traffic and caused slow response for the end user. The customer decided to hold off on the VDI deployment to that site and avoided a potential user experience nightmare. With SteelCentral Aternity, we can also identify any locations and devices where latency can be an issue. Latency can cause slow window loads or annoying lagging, cursors that are not in sync, and general appearance of slowness and pixilation of the system which can be frustrating to the end user. 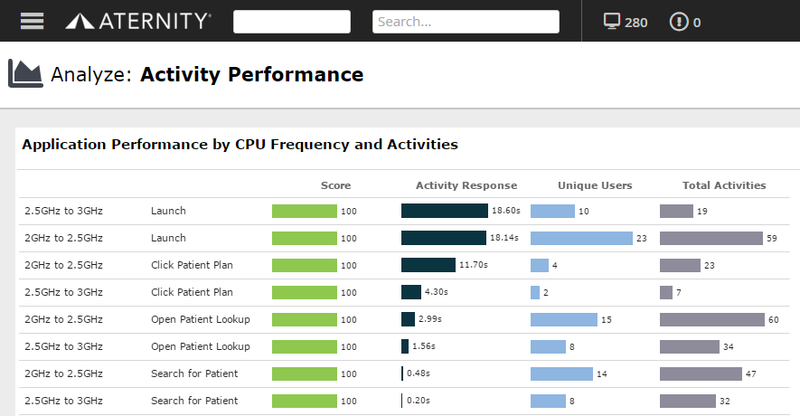 With SteelCentral Aternity’s Troubleshoot Remote Display dashboard, you can see the latency information for locations, individual devices, and the servers they are using and if you have multiple VDI environments in different data centers. SteelCentral Aternity can also show the latency trends over time, which can be beneficial for helping troubleshoot spikes in latency. Is VDI Right For You? Are you trying to decide if VDI would even be a benefit in your environment? During a SteelCentral Aternity Proof of Concept (POC), it is straightforward to come up with the metrics. With SteelCentral Aternity, VDI deployments do not have to be blind to the end user experience. SteelCentral Aternity gathers the information from the end user’s perspective, so that you can accurately and definitively see how your VDI environment stacks up. Desktop and application virtualization projects can significantly reduce IT costs while also empowering end users with everywhere access to the applications and data they need to be productive; using SteelCentral Aternity to validate performance is a great way to ensure success of the project. By monitoring the performance of any business transaction within any packaged or custom application, and correlating it with the key performance indicators of the underlying desktop virtualization, SteelCentral Aternity enables IT to effectively plan VDI migrations, and to troubleshoot problems across all layers of the infrastructure.